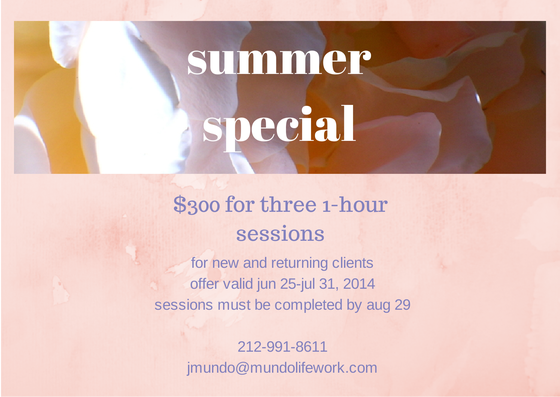 This entry was posted in bodywork, health and wellness, somatic coaching and tagged body-mind, headaches, life coaching, life purpose, migraines, mind-body, self-transformation, somatic bodywork, somatic coaching, summer special by Jan Mundo. Bookmark the permalink. Tuesday evening I had a healing session with Jan Mundo. She used her magical healing touch, relaxed my body, and straightened my neck and back that had been crooked for years. Thank you, Jan.
You’re quite welcome, Charles! I’m glad you came to my studio for a session and benefited from it so much. Thanks for writing your comment.